X-Cart may not be the best choice for small businesses, but larger enterprises will love the incredible power, security, and flexibility of this multifaceted shopping cart solution. As a shopping cart platform, there’s very little that X-Cart can’t do. Users can easily design their stores, set shipping and tax preferences, optimize their layouts with sophisticated marketing tools, manage inventory, and even set up multiple staff logins. X-Cart is compatible with point-of-sale systems like PayPal Here, and it integrates with an array of online shopping outlets like eBay, Google Shopping, Shopzilla, and Pricegrabber. Users at the Multivendor level and above can even set up and manage individual stores for multiple vendors on the same website. Individual vendors can be categorized as “trusted” and “non-trusted,” and each can be customized with its own commission rate. Thanks to the support of PayPal Adaptive Payments, payments can be sent directly to vendors, while the commission is sent to the admin's account. They also offer the traditional scenario when all the payments are received to the admin's merchant account, and will then distribute the money between vendors manually. This is just a small sampling of what X-Cart has to offer. If a user can’t immediately find the feature they’re looking for, they can browse the massive Addons market, which contains hundreds of useful third-party integrations. 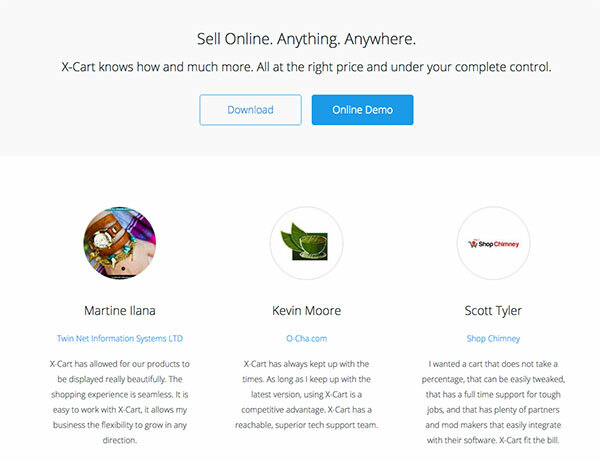 X-Cart has a built-in marketplace. Simply browse extensions, select the ones you want to install or buy them to get the license key, click the button and it's all ready to go. The extension is installed hassle-free, as an application on your iPhone. X-Cart is unique in the world of ecommerce platforms. 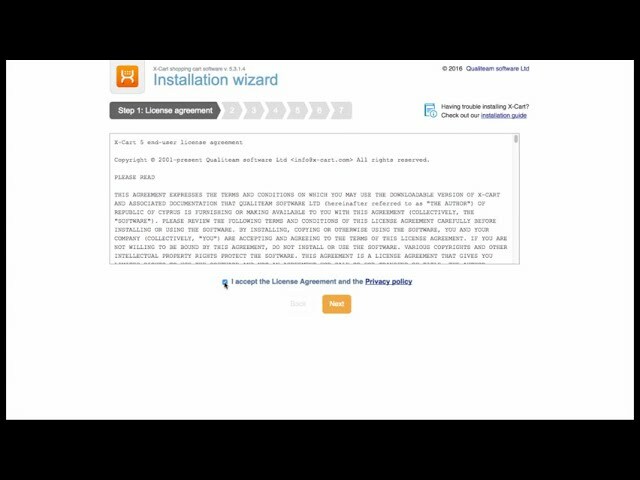 Rather than forcing users to remain inside the company’s hosting environment, they sell lifetime licenses for their software. In other words, the user pays just once for the right to use the platform, and that license never expires. The user can host it with X-Cart, or they can shop around for a different hosting provider. They never have to worry about migrating their store to a different ecommerce platform because the software is theirs to keep. The user should feel comfortable sticking with the X-Cart platform long term because it can be tailored to work with most of the popular marketing tools. It supports more than 120 payment gateways including Authorize.Net, PayPal, and Braintree, and it’s compatible with such popular integrations such as MailChimp, USPS, UPS, CloudSearch, and Google Analytics. To the newbie, the X-Cart layout might seem intimidating. Quite simply, it was built more for power than ease of use. First, the user has to download the software. Then, they have to find a hosting provider and upload the X-Cart files to their chosen server. Depending on the chosen hosting provider, the user may need an FTP client to upload the files. Then they have to run an installation script in their browser (X-Cart will provide this information). Bear in mind, we haven’t even gotten past the installation part yet. Thankfully, it gets a bit easier once the software is operational. After the user has logged in, they’ll see a dashboard that looks similar to that of most shopping cart platforms. There’s a left-column navigation with commands for things like “Store Setup,” “System Settings,” and “Content.” Sales and analytics information can be found in the right-hand column and along the bottom of the screen. Given the massive array of customization capabilities, X-Cart has far more menu items than many of its competitors. Furthermore, not all of these menu items are immediately clear in their purpose. For example, someone unfamiliar with ecommerce platforms might not know what “Modules” refers to (answer: apps and add-ons). Thankfully, X-Cart offers a helpful Quick Setup Guide, which appears right in the center of the main dashboard. A user need only follow the steps on the Pre-launch Checklist to complete the initial setup and start customizing every facet of their site from the design to the shipping preferences to the checkout process. Even the back end source code is customizable. X-Cart is compatible with more than 120 leading payment gateways, many of which are free to download and use. These include PayPal, X-Payments Connector, G2A PAY, FuturePay, TenPay, and Braintree. X-Cart charges no transaction fees, but the individual payment merchants will typically charge between 2% and 3% for each transaction. All transactions are secure thanks to X-Cart’s 100% PCI-DSS compliance. This means that X-Cart adheres to the highest industry standards for payment security. In addition to streamlining the payment process, X-Cart even allows users to set up recurring payments. In order to support recurring payments, customers are offered the X-Payments app. This is a PA DSS certified and PCI-compliant application developed by X-Cart themselves. It is included into the Ultimate plan with a 1-year X-Payments subscription. This is great for businesses that run subscription services. Users can choose between flat rates or predefined tax rates and shipping quotes, and they can easily process shipments using one of many compatible vendors, including USPS, UPS, DHL, FedEx, and Canada Post. X-Cart has even streamlined the checkout process by offering single-page checkout. This means fewer abandoned shopping carts and a better user experience. XML sitemaps: These make it easier for search engines to index all of the pages on a site. Canonical URLs: This feature allows users to decide which pages should be favored by search engines if the same content appears on multiple pages throughout the site. URL customization: This allows users to choose the most search-engine friendly URLs for each page on their website. Metadata customization: A user can customize their title tags, meta descriptions, image tags, and other important metadata with all of their target keywords. The platform could benefit from some helpful keyword research tools, but all in all, X-Cart is quite the SEO powerhouse. The hosting is where things get a bit complicated. X-Cart does offer some great hosting plans, but these plans must be purchased separately from the ecommerce platform license. 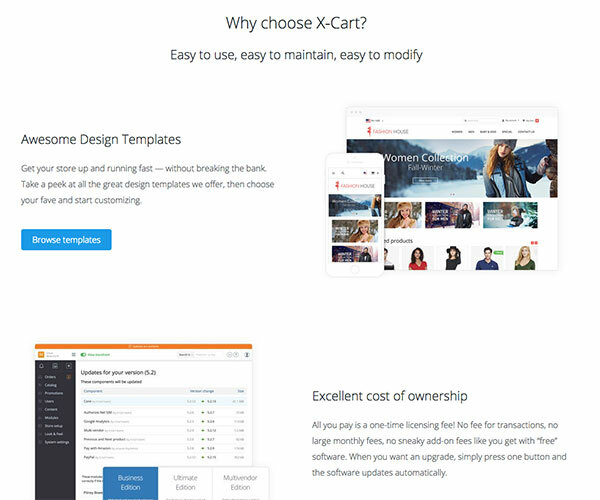 For example, if a user purchases an X-Cart Business license for $495, they could then install the software on a separate X-Cart Starter hosting server for $29.95 per month, or they could take it to a different hosting provider. Here’s a breakdown of the different plans that are available for both the licenses and the hosting. X-Cart’s hosting plans all include daily backups, hosting support, and off-site data protection. Each plan also comes with an SSL certificate, which encrypts incoming and outgoing data for greater security. Though the hosting plans can get a bit pricey, each user gains access to a Virtual Private Server (VPS), which is faster, more private, and more secure than the shared hosting plans offered by many ecommerce platforms. X-Cart offers 24-hour phone support, but there’s an enormous catch. Technical support comes at a cost, and a hefty one at that. The user creates a support ticket on the company’s website and then awaits a phone call. A normal request costs $99; an urgent request costs $139 (urgent tickets are addressed within two hours). Users can also purchase unlimited support for $149 per month. For those who don’t want to pay for technical support, X-Cart offers a HelpDesk with hundreds of articles, videos, and other tutorials. There’s also a community forum where users can ask questions and receive assistance with common issues that arise. It’s also worth noting that the X-Cart Ultimate license includes one year of free premium support, but this won’t benefit the majority of members. 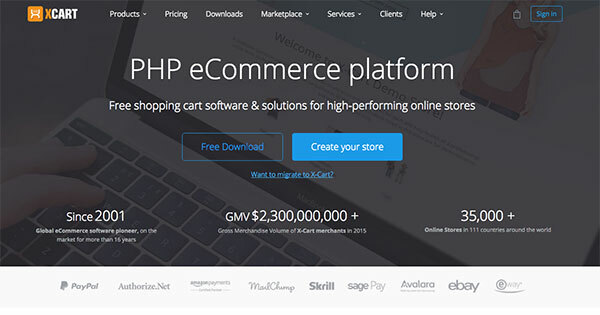 X-Cart is designed for serious ecommerce businesses. Though it’s not the simplest or most economical choice, it’s almost infinitely adaptable to the needs of every store owner. With hundreds of payment gateways, extensions, and marketing tools, the platform gives every user the freedom they need to create a storefront that’s entirely their own. The superior SEO tools and enhanced security features are even more reasons to consider this versatile solution. At the end of the day, an ecommerce solution is only as good as the sales it generates, and that’s why we were especially impressed with the wide range of marketing features. Users can highlight bestsellers and featured products, and they can use the analytics to track their trends and see which products are performing the best. It’s easy to install attractive banner rotators on the home page, and social media buttons can be added at the click of a button. The single-page checkout is a nice touch, and the abandoned cart recovery tool is also great for that all-important bottom line. When it comes to marketing and sales, it appears that X-Cart truly has thought of everything. X-Cart has been developing ecommerce solutions since 2001. It has the distinction of being the first downloadable PHP/MySQL shopping cart platform ever created, and it remains one of the most downloaded shopping cart solutions. In fact, X-Cart is currently used by more than 35,000 online stores in more than 100 countries. In 2016, X-Cart stores managed more than $2.5 billion in gross merchandise volume.